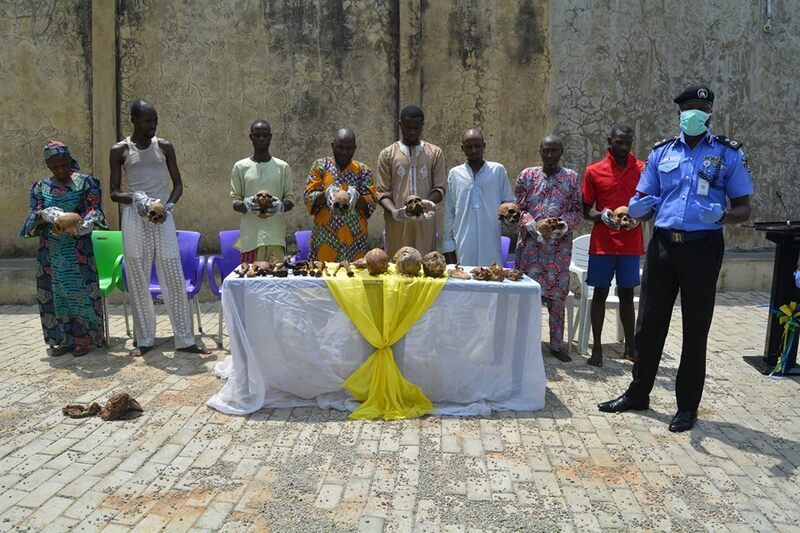 Earlier, eight alleged ritual killers, including a woman, were brought to the Nigeria Police Force after being arrested in Ilorin, Kwara, with 11 human skulls. The suspects, identified as: Azeez Yakubu, Prime Suspect, Ahmed Yahaya, Abdulfatai Kadri (Commander of the Vigilantes), Aishat Yunisa, Lukman Saka, Abdulganiyu Bamidele, Soliu Ayinde and Abdulrasaq Babamle, were arrested by the special IGP Monitoring Unit. Azeez Yakub a.k.a Baba Muri (Prime Suspect), a notorious armed robber, was arrested, charged and sentenced to prison. This suspect, now in police custody, has made a confessional statement to the Police Investigation Committee, he admits, acknowledging that a Abdufatai Kadri alias (Adedoyin), the Adeta Zone vigilante, introduced him to the business and also human skulls and other bodies delivers parts for him to sell. 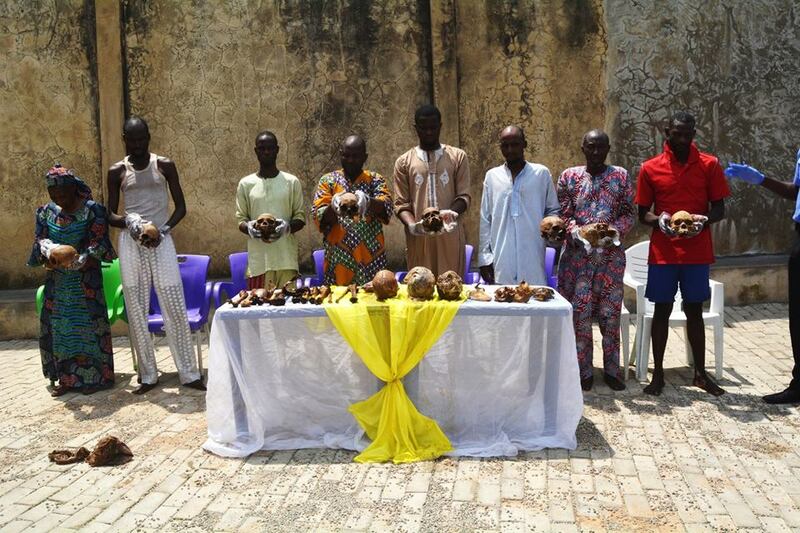 Eleven (11) human skulls were retrieved during his police search of his residence. 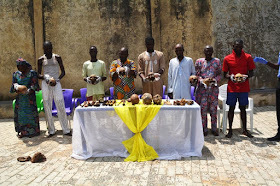 The lead suspect confessed that Abdulfatai Kadri had exhumed twenty (20) human skulls that he exhumed from the central cemetery of the Ilorin parish, which is located at Ilorin, Idl, in the state of Kwara. He further admitted that Abdulfatai Kadri aka (Adedoyin) usually brings the human heads to him in batches of four (4), six (6), eight (cool for safekeeping) and usually collects them within a day or two, and also informs him of the personalities in Ilorin and others he usually delivers the heads to. Ahmed Yahaya and Lukeman Saka were indicted in the confession statement of prime suspect Azeez Yakub. They admitted that they had bought two (2) human skulls from the main suspect by Aishat Yunusa, honed for their use and rituals. Abdulfatai Kadri a.k.a (Adedoyin) is a commander of the Vigilante in the Adeta Zone, who was accused by the main suspect of importing him into the business and also selling the human skull and other body parts. He is still being investigated for his criminal roles in the incident. Soliu Ayinde a.k.a Baba Fawasi - this suspect was also in police custody and confessed to be a member of the syndicate, which received human parts from Abdulfatai Kadri a.k.a (Adedoyin), commander of the Vigilante, and Azeez Yakub, the main suspect. In his possession, human bones were cut off the leg of one of their victims. He admitted to the investigators that the main suspects Azeez Yakub and Abdulfatai Kadri a.k.a (Adedoyin) work together. At a time when he asked Azeez Yakub for human skull, Azeez Yakub in his presence spoke to Abdulfatai Kadri a.k.a (adedoyin) to bring the human skull after collecting fifteen thousand Naira N15,000 from him. Abdulganiyu Bamidele: He admitted that he had bought the skull of the main suspect, Azeez Yakub, and was still providing it to his friend, a Kayode.